Scientists seem to be forever complaining they’re marginalised so, it might be tempting to roll your eyes. When a group from the UK drove a coffin down Westminster last May they were described as “childish”. This recent Canadian action might look similar, but it was far from childish. They weren’t simply sticking up for their pay cheques, they were sticking up for the right to ask difficult questions and provide uncomfortable knowledge, in particular when it comes to the Arctic. They were sticking up for the things they research as well as the right to keep doing their research. They were sticking up for the planet. The Canadian scientists who spoke to the Guardian were keen to stress this is less about research budgets versus the rest of the economy, and more simply evidence versus ideology. There have been mumbles that science in Canada was more than usually difficult for a while. In February, there were reports that scientists had won a historic battle when, in a private meeting on the impact of oil sands extraction in Alberta, they’d stood up for independent pollution monitoring. I read this concerned that they’d been put into a situation like that meeting in the first place. In May, many were shocked to hear the Canadian government had cancelled its funding for the Experimental Lakes Area, a laboratory complex over 58 remote lakes in north-west Ontario that has been running since the 1960s. As one scientist told Nature magazine, it’s like turning off the world’s best telescope. The UK science media, perhaps particularly attuned to issues of free speech after years of fighting libel reform, quickly picked up the story. BBC correspondent Pallab Ghosh, visiting Vancouver for the annual American Association for the Advancement of Science (AAAS) meeting, wrote of scientists being “muzzled” by the Stephen Harper government, especially when it came to climate change. Robin McKie, the Observer science editor, also reported on this issue, referring to Naomi Oreskes and Erik Conway’s book, Merchants of Doubt, to stress the role of corporate lobbying in muddying scientific contribution to debate on environmental issues. Canada’s natural resources minister might complain about foreign campaigners and “jet-setting celebrities” trying to hijack their country with their opposition to local environmental policy, but there are reasons why there was international outcry about the Experimental Lakes Area. Scientists from all over the world studied there for generations: it’s where the first evidence for acid rain came from. There are also reasons Canada won Fossil of the Year at the Durban talks last December, why the Daily Mail mentions Canadian people appealing to the Queen over Alberta oil sands and why, despite having passed an austerity budget in April, the Canadian government still found money to invest in Arctic drones. We can’t pretend Canadian science is simply a Canadian matter any more than we can pretend we can separate the natural world from our political decisions. After years of hearing science journalists and policy wonks glumly mutter “oh, yeah, Canada”, I see hope. 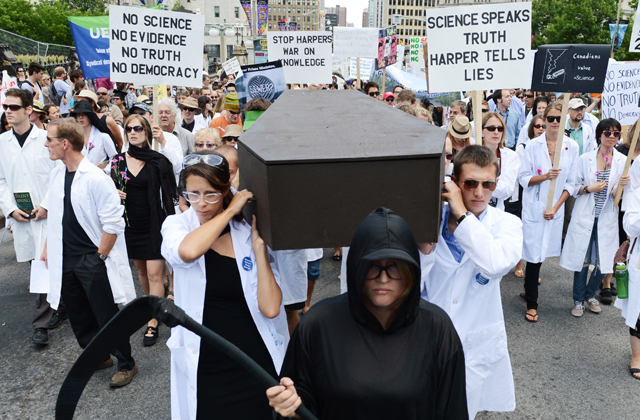 It looks like the Canadian scientists are not only getting organised, but doing so in public, in a way that invites others to stand with them. For all their geeky garb and slogans, one speaker was calling for non-scientists to stand up for evidence too. The Indigenous Environmental Network stood next to those in town for an evolutionary biology conference. Protestors held papier-maché fish to represent animals under threat alongside placards referencing Einstein. PhD students stopped mid-march to chat to the bemused onlookers. O’Malley’s reports, and others, went viral as people all over the world were inspired. It was a shared protest. It’s easy to see scientists as dogmatic, passing on rarefied expertise from on high. Some are. But at its best, scientific evidence can play a liberating role in political discourse and is worth standing up for. Yesterday’s message of “No science, no truth, no evidence, no democracy” is an idealistic view of science in society, but if it really is said in thoughtful co-operation with the public at large, it’s a beautiful thing to behold. This entry was posted in Climate Change, Their Governments and tagged Science. Bookmark the permalink.